Show Bag - Express Corporate - Promotional Products - Delivered Fast! Our Best Value Show Bag! 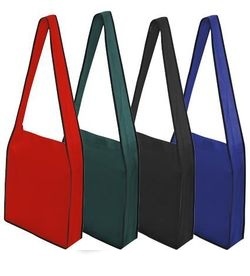 Choose from 4 classic colours to compliment your logo and corporate image! Help the environment by choosing this eco friendly option for your shows and events! Reinforced stitching around the edges and handles mean this bag will last! Available on our 5 day express service at no extra charge! Impress your boss with this unbelievable find! Prices start at just 90p!